A few weeks ago, we ventured back out to Tremont for dinner, this time visiting Lago. Lago is another cozy little restaurant located in a historic building, as many in Tremont are. Their focus is on northern Italian cuisine (though if you asked me, I couldn’t give you the difference between northern and southern food). They also feature “the most eclectic collection of wine in the area,” and the wine list is exclusively Italian. Which, again, would be of more interest to us if we were big wine drinkers, but for those who are, this could be a nice perk. It was a little on the noisy side, but not so much that we couldn’t hear each other. We were also seated at the table nearest the waiting area, and close to the bar. This wasn’t a problem until it got a little later and more people started to arrive… and slowly migrate toward us, to the point where I was ready to ask one lady if she just wanted to pull up a chair and join us. Kind of weird, and maybe it’s just me, but I’d expect most people to have enough awareness of their surroundings that they wouldn’t end up carrying on a conversation right next to the table of other diners. In any case, this was not the theme of the night – for the most part, we were not bothered. I just don’t like rude people. 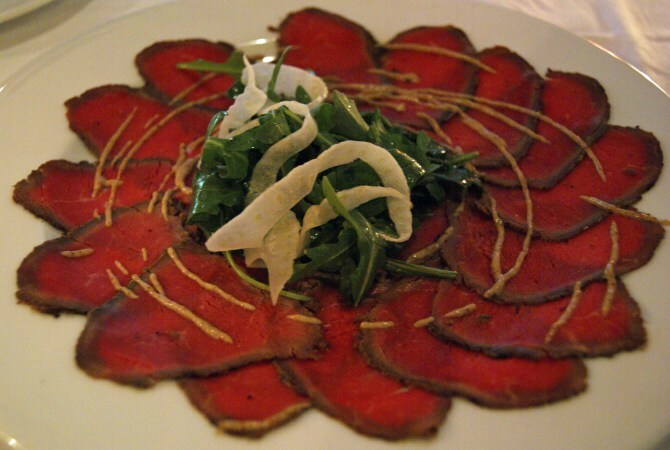 For starters, we had a beef carpaccio with marinated fennel, arugula, and a truffle mustard vinaigrette. We’re not really carpaccio connoisseurs, but I have to say, this one was delicious. The beef was perfectly, evenly sliced razor-thin, and almost literally just dissolved in my mouth. The truffle and fennel added a nice level of flavor. 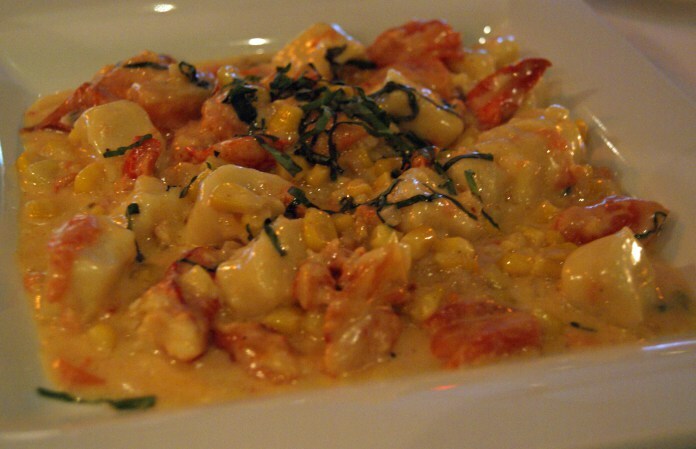 S got the gnocchi, which was a veritable feast, and came with lobster chunks, corn, roasted tomato, basil, and truffle. Very creamy and quite flavorful (with ample amounts of lobster), and the gnocchi were perfect – not too soft, not too chewy. 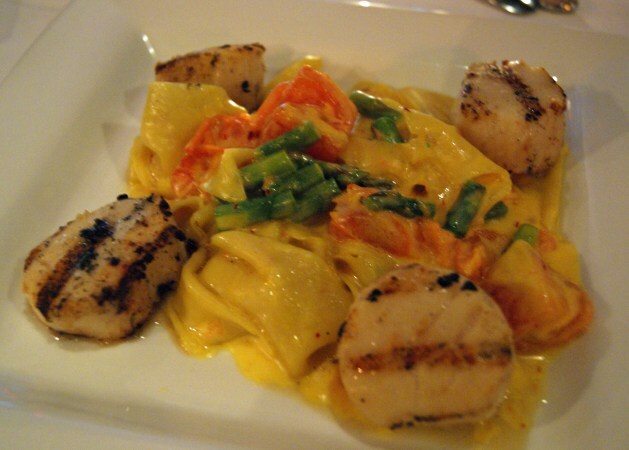 I selected one of the nightly specials, which on this evening was a papardelle pasta, complete with scallops, tomato, and asparagus, and finished with a saffron cream sauce. Again, the flavors all melded together wonderfully, and there was a fine mix of textures, with the tender chewiness of the scallops and the slightly crispy asparagus. 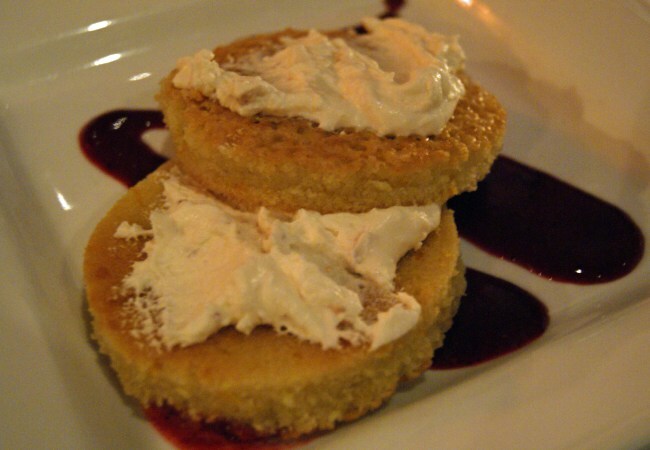 And finally, for dessert, we enjoyed a scrumptious almond cake with a strawberry-fig compote. Dense, moist, and yummy. Final verdict: we’ll give Lago 5 3/4 stars out of seven. Not quite at the six level, but still very good. Prices were maybe slightly above average (most entrées in the $18 -25 range), service was acceptable, if not consistent (I think a different server took care of each course for us), and the food was very good. Recommended.